As a child, some of the fondest memories we have are those visits from the Tooth Fairy. We’d proudly show mom and dad our loose tooth and when it finally wriggled free from our gums, we’d place it hopefully beneath our pillow, anxiously awaiting what might be in its place when the morning arrived. When we get a bit older, however, our dreams about loose and lost teeth take a bit of a different turn. You see, our teeth tend to be a common dream theme with a variety of possibilities for symbolism. Anxiety and stress are the primary sources of dreams about problems with teeth. For example, the figure of speech “grind your teeth” is associated with anxiety and stress, something that grinds you down. 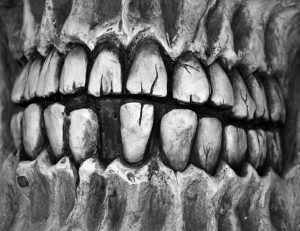 In dreams, the grinding of teeth is a physical representation of a personal situation, in other words, showing how you feel. Anxiety and stress can also be symbolized by teeth cracking, crumbling, or even falling out. The symbolism here is created by the connection between distress in your dream about your teeth and distress in your waking life. Crumbling teeth in a dream can be a visualization of something in your life or yourself that is falling apart. This could include your finances, your business, a relationship, or perhaps an opportunity. So how do we explain tooth loss in our dreams? Dreams compare losing teeth with losing something in life. This could symbolize loss of a loved one, loss of self-image, loss of reputation, or even loss of face or embarrassment. But loss of teeth in a dream may also be associated with changes in life. Just like losing our baby teeth is a rite of passage, losing teeth in a dream may also mean that we are moving into another phase in our lives. While losing our teeth in dreams typically has a negative connotation or connection to something real, that doesn’t mean you have to live with the fear of lost teeth when you are fully awake! Make sure you follow up with regular appointments to your dental professional with regular checkups, x-rays, and cleanings. One thing’s for certain… it will have you sleeping more easily at night! A type of preferred provider organization under which employees must use providers from the specified network of dentists to receive coverage there is no coverage for care received from a non-network provider except in an emergency situation.